AnshuBlog: The Stack Fallacy : Go forth and multiply — your apps. Go forth and multiply — your apps. There’s a new wave of reporting focused on the post app era. The Recode announces “App Boom is Over”. Quartz points out how most users never download any apps. Let me be very clear: The App Boom is Not Over. The reporting on this topic made me think of an imagined Yogi Berra quote. "Nobody downloads apps anymore, it’s too crowded." Let’s start with facts. The real numbers are amazing — we are in an unprecedented era of growth when it comes to revenue from apps. Revenue is hard to manipulate since it ties back to financial filings by Google and Apple and needs to be audited. 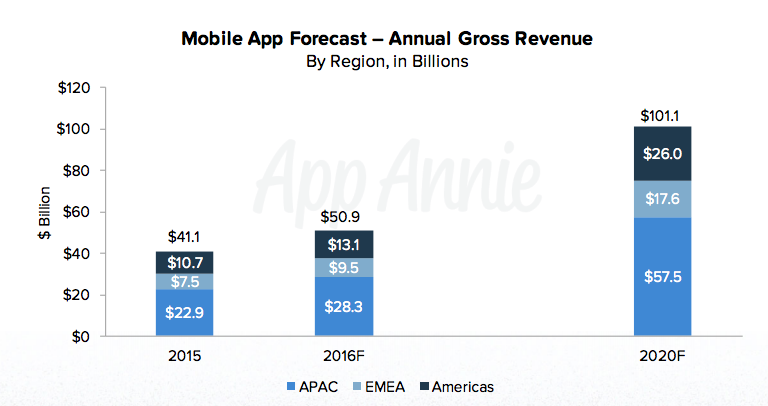 App revenue is growing and is expected to reach $100 Billion dollars by 2020. The news and editorial stories doing the rounds have many flaws. Take app downloads news as an example: it talks about how apps downloads have stalled by pointing out the numbers for top apps. In truth, the newer apps like Uber, AirBnB, Snapchat are all growing fast while, expectedly, most top apps that have been there for a while and have saturated the users like Facebook are not growing any more. To use this data, to point to the end of an app boom is somewhat misleading. There has never been a better time to be an apps developer. Billions of users have access to cheap new smartphones, data plans are becoming available globally and the app store owners like Apple & Google are being more generous than ever. Apple is supporting lower fees on subscription revenue — going from 30% to 15% in year 2 onwards. As a SaaS guy, let me tell you this is an amazingly insightful decision by Apple — if most developers can be nudged to think subscriptions, in turn making consumers pay more per month, you end up with a very long term, sticky revenue base. Even more importantly this revenue is cheaper and results in a virtual lock in as consumers with more subscriptions are much less likely to switch ecosystems. Go forth and multiply. Your apps.